We shortlisted a total of 10 backpacking saws- 3 pocket saws, 3 bow saws with 4 folding saws and then carefully studied them for over 15 hours. Finally, we had our top contender for each of these three categories of saws. The LivWild 26″ Camping Pocket Chainsaw is our top pick in terms of pocket chainsaws. Save yourself a buck or two with the Chainmate CM-24SSP 24-Inch Survival Pocket Chain Saw priced at only 7.15 dollars. The title of the best bow saw goes to Sven Saw-21″. A more affordable option in this category is the Truper 30261 Steel Handle Bow Saw at just 20.21 dollars. Lastly, the Silky Professional Series Gomboy 240 Folding Landscaping Saw is the best option in the folding saw category. For 15.79 dollars, you will get the Gerber/Fiskars Exchange-A-Blade Saw in the reasonably priced section. Let us take a deeper look into the world of backpacking saws. The most portable of the lot is the pocket chainsaw. It will serve great as a backpacking saw but only for so long. Its blade will go blunt the fastest of the three though it is irreplaceable in nature. You have to regularly oil and sharpen it if you plan to get a good use out of it. You will find the folding saw somewhere in the middle of the pocket chainsaw and the bow saw in terms of performance. Use it comfortably to trim the tree limbs. Almost as portable as the pocket chainsaw. But once the blade goes blunt, it can only be replaced and not sharpened. It is the biggest of the three backpacking saws but surely the most useful. It comes with two replaceable saws – one for green wood and the other for the dry one. This kind of structure makes it useful even if one of the blades break during the cutting process. Some of these saws can be folded or disassembled too. The spending on a backpacking saw does not stop at purchase itself. The upkeep takes its share of investment too. And after all that, it might abruptly break down in the process if you go for a substandard brand. That is why warranties and guarantees are in place with the established brands to back your expenditure so that you never get stuck with a faulty piece. You need to take into account all the parameters that you want this saw to excel in. Which kind of wood will you be cutting the most and how often? Are you planning to do light cutting related chores or are set on felling trees for your requirements? Accordingly, you need to make arrangements to keep the wood sharp or replace it if that is the need of the hour. One of the main requirements of a backpacking saw is portability. They need to be light and easy to carry along on the trips. These take into consideration the size, weight and how travel-friendly they are for certain journeys. You might have to trade off portability for utility in most of the cases. But, your selection will surely be suitable for all your applications then. Now, take a look at our top selections along with their brief description. These chainsaws have heat-treated Carbon Steel Teeth for improved durability. They are extremely light and compact thus making them your instant favorite. Cuts the firewood into logs in seconds without you exerting yourself too much in the process. It is fitted with proper safety features to make it suitable to be used by people of all ages. It is a must-have tool for camping, yard work, emergencies, and other relevant applications. 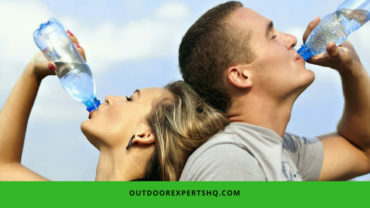 Fits perfectly with the rest of the items in your camping/emergency kit. Both pushing and pulling action can be used during chopping with the help of its bi-directional blades. Sometimes it might get stuck thus bringing the whole cutting process to a halt. 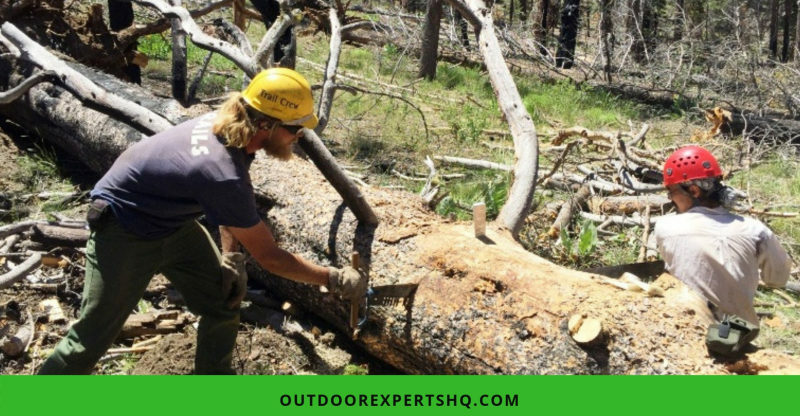 This professional grade chainsaw can be used in a number of scenarios including during hiking, camping, mountaineering and others. Previously it was only available for the professional or military use but now we all can benefit from its outstanding performance. It comes with carbon steel teeth and next level portability. It has in its very own belt loop pouch where you can safely store it and carry around. The Special Patent Carbon steel Diamond tip tooth chain is used in its construction. The oversized and heavy duty strap handles are maneuvered easily even with winter gloves on. The blade goes blunt too fast which makes it difficult to count on it when out in the woods. This pocket chainsaw has been created keeping a lot of possible situations in mind. So whether you have just run out of the wood in your forest cabin or you need to chop down the tree blocking your path, you can totally rely on it. Its flexible, sharp and tough blades will assist you in the best way possible in the outdoors. The blade is treated with special agents to keep it rust and hence corrosion free at all times. The 36 inches long and thick chain is best for giving that extra power to your chainsaw in the wild. It comes with the ironclad lifetime guarantee for absolving you of all your doubts. The chainsaw might be too complicated to be used often and easily by the beginners. Next, we have the bow saws. The saw has been designed to cut through lumber easily. Its design favors you in tough and demanding situations. Straight cutting with high blade tension is made possible with its innovative tensioning mechanism. The handle comes with knuckle protectors to keep you safe and sound no matter what. Easy handling and durability are intrinsic to this model with the help of lightweight, and high-quality steel tubings used in its construction. The blade is 30 inches long to give you the necessary power and range of action during use. Quick release changes can easily be made with the heavy-duty and lightweight Bowsaw frames. The blade might be too long and keeps slipping from the hands of some users. The tempered Swedish steel blade will introduce a whole new level of excellence in your life. The blade is available in 7.5, 15 and 21-inch sizes. When not in use, you can just release and fold it inside the aluminum handle. It offers a greater level of control over the wood during chopping and construction process. The 7.5-inch rust-resistant blade can be used to perform all kind of tricky woodworking chores. It can effectively chop a wide range of materials including wood, plastic or even a bone. The stock blade comes with seven teeth per inch to carry out all sorts of chopping tasks. Some users are not happy with the difficult to manage the structure of the saw. Comes with a 30-inch blade to help chop off every single branch on the log. The blade stays perfectly tight during work with the help of its Cam-Lever Tension system. You just need to clean and oil it properly to maintain its performance for the following years. The quick change system makes it easy for us to switch the blades seamlessly while carrying out the job. At just $20.21, it is one of the cheapest yet extraordinary utility tool in the market. The blade provided along with this package is of good quality and durable nature. The tensioning of the blade is performed very precisely without any sort of hiccup. The blade might keep popping from the anchor points since they are not that well equipped to hold it in place. Finally, we have the folding saws to browse and compare. The best of the Japanese technology is used in the creation if this folding saw. It comes with the amazingly comfortable ergonomic handles that make the usage all that easy. Impulse hardened teeth with precision ground make it a must-have accessory in the toolkit of every savvy outdoor person. Silky Saws offer a limited lifetime warranty with this model. It belongs to the new professional series edition of the silky saws. You get a free clear plastic hinged carrying case along with the package for easy carrying and storage purpose. Few users have received a defective product in their shipment. The structure of this saw accommodates two saws with an easy switching mechanism in place. One is a fine tooth blade while the other is the double blade. One blade specializes in fast operation while the other is useful when stumped with the dense wood material. These sharp and interchangeable blades perform the desired task effectively without any hassle. Fine blade is for bone while the course one is for wood. At just 8.7 ounces, it is quite portable to carry around with us on the getaways. The body is cheaply made that makes it very unreliable especially in the uncharted territory such as the woods. A total of four steps are involved in the manufacturing of the RazorTOOTH Saw blade. The finished product thus created has maximum durability, hardness and friction resistance. The three-sided teeth make the saw a lifesaving gear to take along with while exploring the great unknown. You can easily cut the 5 to 6-inch branches with the help of this 10-inch blade. The co-molded and ergonomically designed handle will offer you a comfortable grip during extended use. The blade is easily latched which reduces the risk of injury that much. The blade and other parts of this saw break quite easily within few initial uses. You will find this saw quite useful if you are into hunting, camping or just exploring the incredible outdoors in general. A suitable material coats the blade for active prevention of rust and friction. And, the handle is made up of two components along with a leather strap for better grip. Use it to cut to cut bone, green wood, dry wood, plastic and other kinds of materials. Stays locked when it is folded and comes with a reliable safety lock. It is an all-purpose saw with 7-1/2 -inch long blade for maximum utility. The lock design is faulty that might give you a false sense of security which can be dangerous. This wraps up our detailed account of the best backpacking saws out there. A backpacking saw will make you ready for whatever the forest throws at you. Our best picks are LivWild 26″ Camping Pocket Chainsaw, Sven Saw-21″ and the Silky Professional Series Gomboy 240 Folding Landscaping Saw are the best backpacking saws in their respective categories. Which kind of backpacking saw do you own? Let us know all about it in the comment section below. And keep this information cycle on the move by sharing it further with your family and friends.